One year ago, I was catching abundant large fish in Canada with a couple of friends. The fish were plentiful and we spent 8 hours at a crack catching them. I loved every minute of it, even in the bad weather. The thrill of thinking that your next fish could be a monster fish or a record breaker, well, you just can't put a price on that. Paired with the good company of a couple of friends, and it's just a great, great memory for me. Now, because I don't own a boat, fishing locally is a bit less rewarding. I hardly ever get out around town here, so those trips to Canada were where I'd try and get it all out of my system in a single trip. I've found you can't do that with fishing because the minute you stop, you start wondering where and when you'll fish next. Well, I had a jones to wet my line the other night and had seen a potential spot on the way to dropping Ben off at camp. The spot is on the Fox River down in Big Bend, so I drove there and parked in the gravel at the approach to the bridge. Not knowing much about the spot, I started fishing with a Rapala Shad-Rap, a fat minnow-looking thing. The river was flowing pretty good, but it's good and deep, so I wasn't worried too much about snags. The shad-rap wasn't the answer, so I switched lures a couple more times. It was with my blue Rattlin' Rap that I got my first action. I felt a tug and the adrenaline kicked in. I reeled furiously for a few seconds, trying to tire the little guy out. As I reeled it in, I began to sense that it wasn't a fish after all. There was no left-to-right movement or much pull at all. When I got it to shore, it turned out the joke was on me. It was an old Capri Sun package (Photo at top). I have to say, it is my FIRST catch of a drink bag, so there is that. Also, I think those bags are always in season, and there is no limit. Besides, I like to chalk it up to doing my part for the environment. Suffice it to say, fishing in Waukesha isn't quite the same as fishing in Canada. Not content with having bagged just a bag, I crossed the road to the other side of the bridge in the hopes that it would be a bit more productive. I changed lures a couple of times and still had no luck. Out of desperation, I put on a spoon; a shiny gold and silver daredevil looking thing. While I wasn't catching much of anything, it sure was nice to be out there trying. I just love being on the water, outdoors, killing time. I was literally two casts from calling it in when, wham, I got a strike. 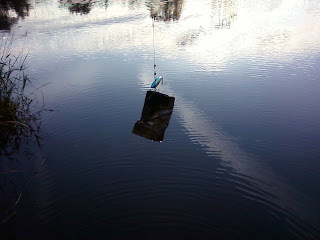 It pulled pretty good, so I set the hook with an attitude and started my retrieval. The thing gave up a pretty decent fight. It felt nice to have anything on, so my goal was just to get a good look at it, if not a picture. After a minute or two, I got it to shore. It looked like it had thrown the hook, as it was in his gill on the outside. I got lazy and tried to heft him onto shore, and the hook came out. It looked to be about a 16" largemouth bass. It sat there for a minute and then swam happily away. This of course meant I had to stay and exercise my futility for another 30 minutes, because that's what fishermen do. In any case, it reminded me that if there's no one to share the excitement and the joy (or the proof) of catching, it's just not the same. This is not to say that it wasn't the high point of my day, because it was. I hope to do more fishing from my new spot and will blog if I have any luck.